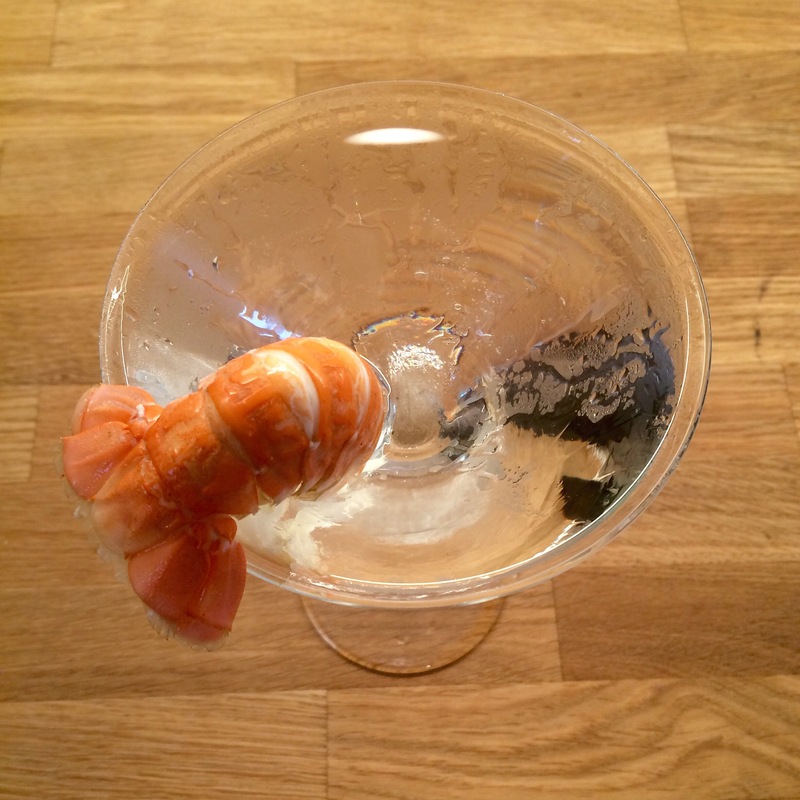 Seafood goes well with a martini. 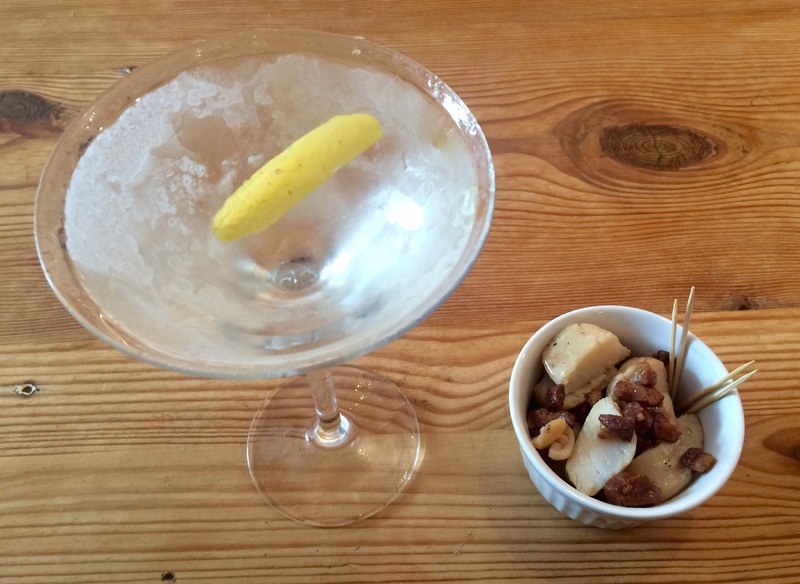 The salty freshness compliments the sharp but oily astringency of a cold martini. 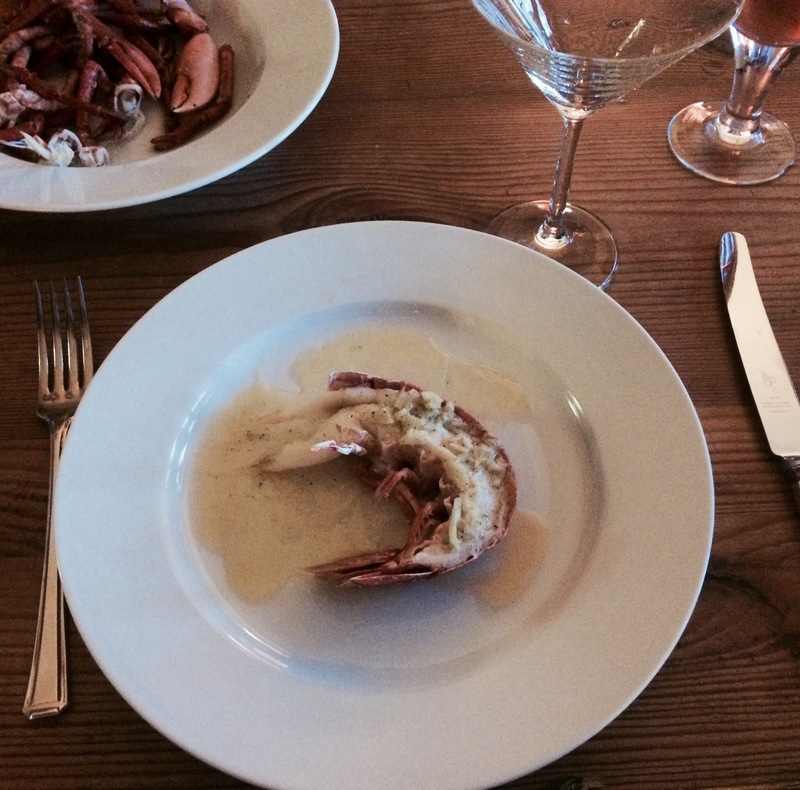 Seafood also has an air of simplistic luxury, thus making it a natural pairing for the drink. I’ve put together a couple of examples of things I’ve made/served or otherwise eaten with a martini over recent months. While some of these things have been in London, lots have come from my original homeland in the Hebridean islands. 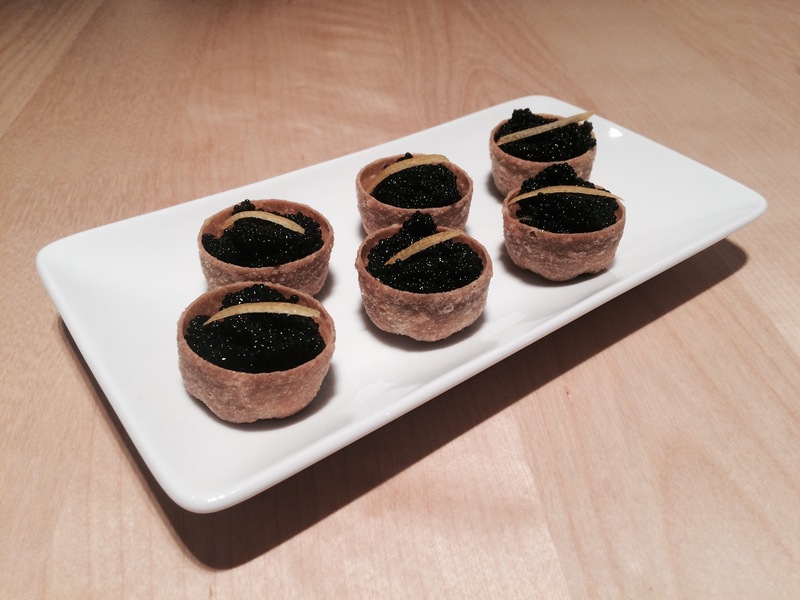 Here are some croustades filled with fish roe topped with thin strips of lemon peel. They’re savoury and bite sized, with interesting textures (mainly the crunch of the croustade and the fresh bursting of the eggs in your mouth). Scallops are one of my favourites. Our very kind neighbours gave us a huge tub of them the other day and mum fried them briefly in bacon fat from the morning’s breakfast. This combination involves quite a high concentration of cholesterol so don’t eat them all yourself. Consume in moderation and share them with friends or family. 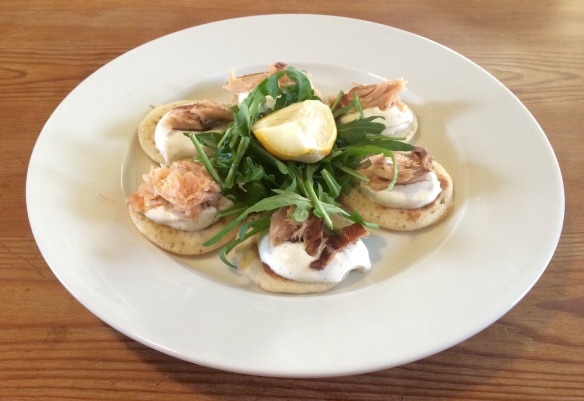 Here are some miniature blini with hot smoked salmon and sour cream. 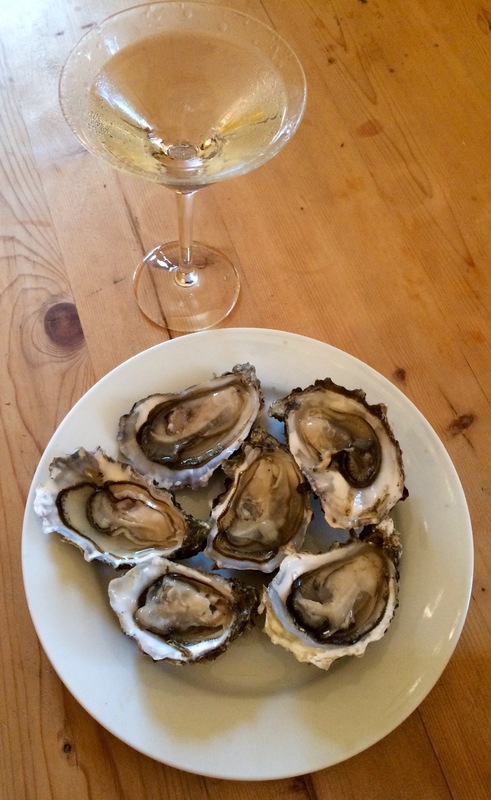 I like oysters even more than scallops. 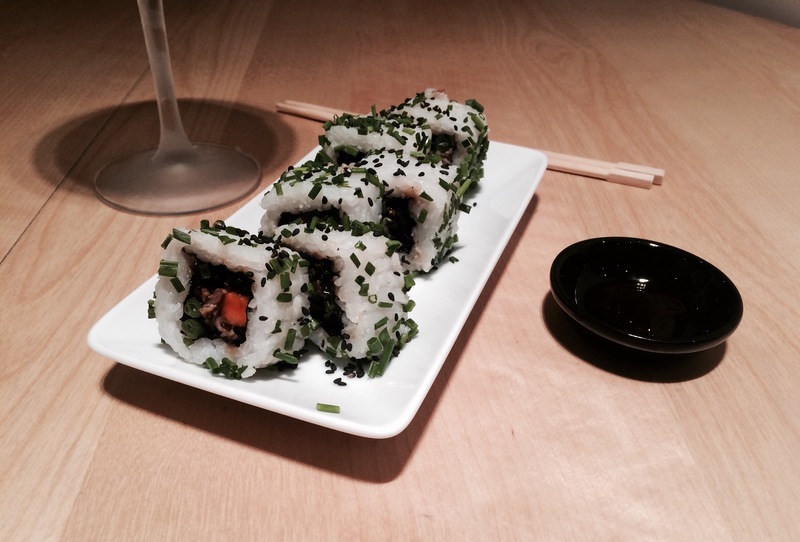 Maki rolls are nice, healthy and diverse, although I wouldn’t normally eat high quality sushi at exactly the same time as a martini as the intense gin flavour could overpower the subtle tastes of things like sashimi. 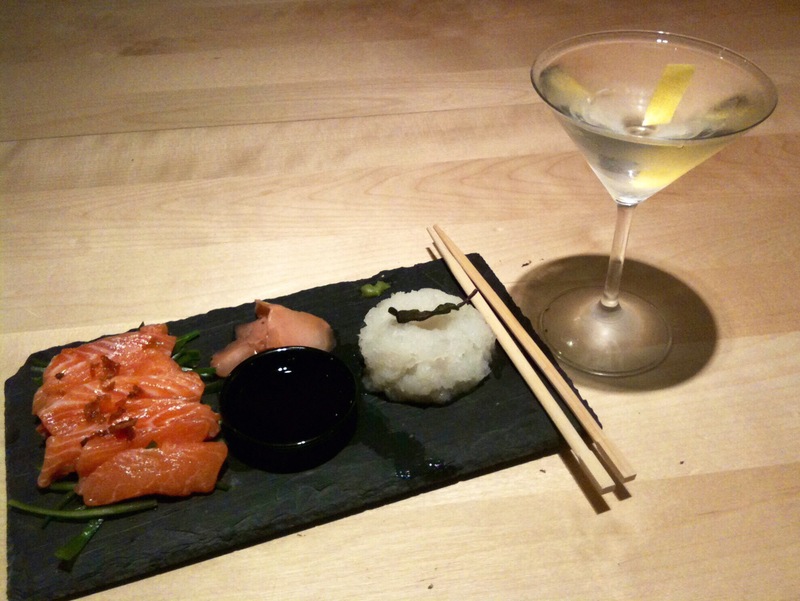 I would rather have a martini with some kind of salty, more robust appetiser first then eat the sushi with tea or beer as a more gentle accompaniment. I’m not going to say no if you twist my arm though. 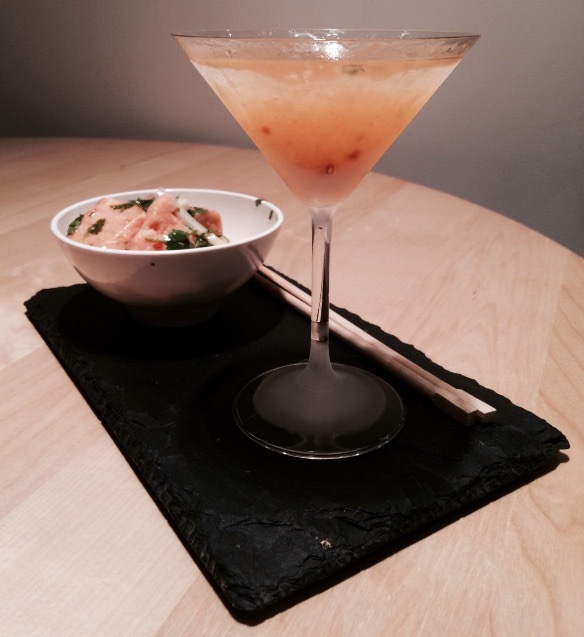 Here’s a martini served with some salmon sashimi on shredded cucumber with flaked bits of crunchy salmon skin sprinkled on top, alongside gari, soy sauce and a daikon relish. 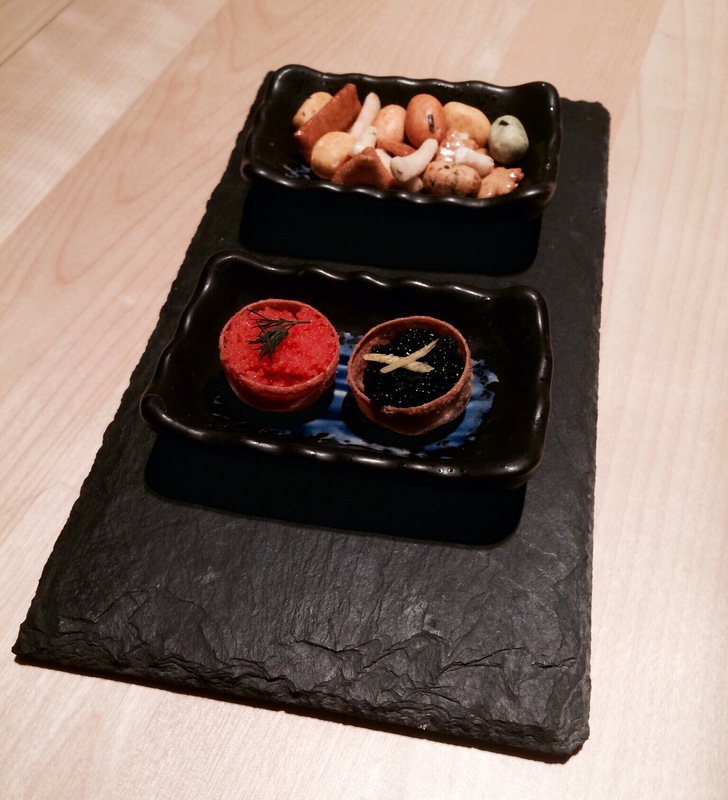 Here are some more croustades containing fish roe (garnished with dill and small strips of lemon peel), as well as some Japanese seaweed crackers. 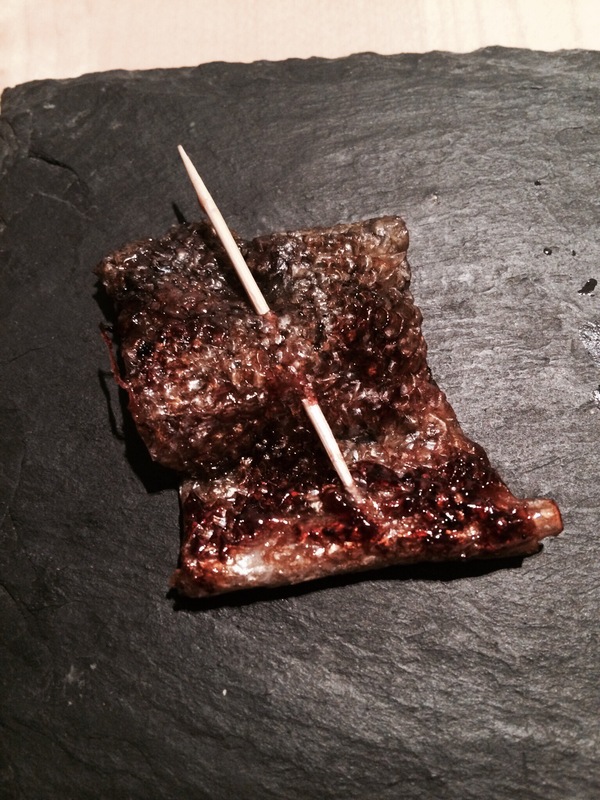 Here is some very simple roasted salmon skin. Not everyone seems to like the skin… but I definitely do. 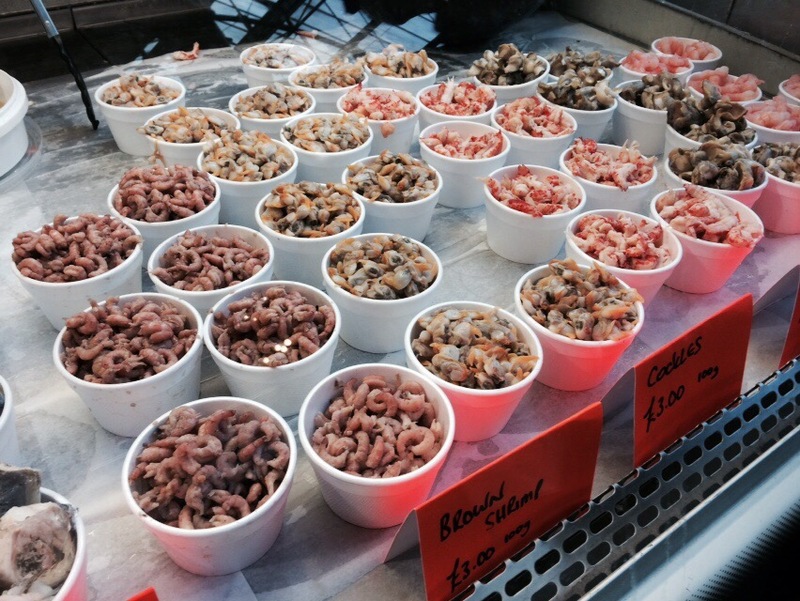 You can get all sorts of goodies in Borough Market if you’re in London. 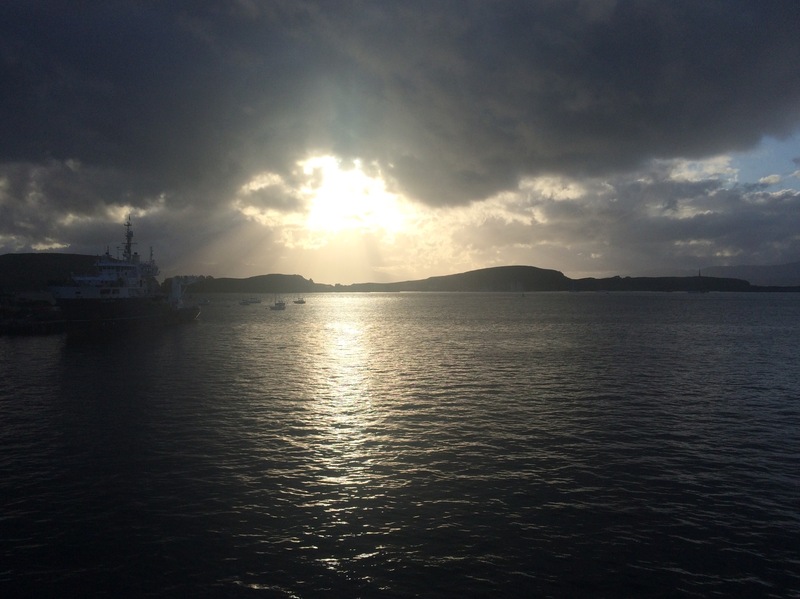 Or if you happen to live in the Hebrides you might have some generous fishing neighbours who occasionally drop off a bucket of some oceanic harvest. 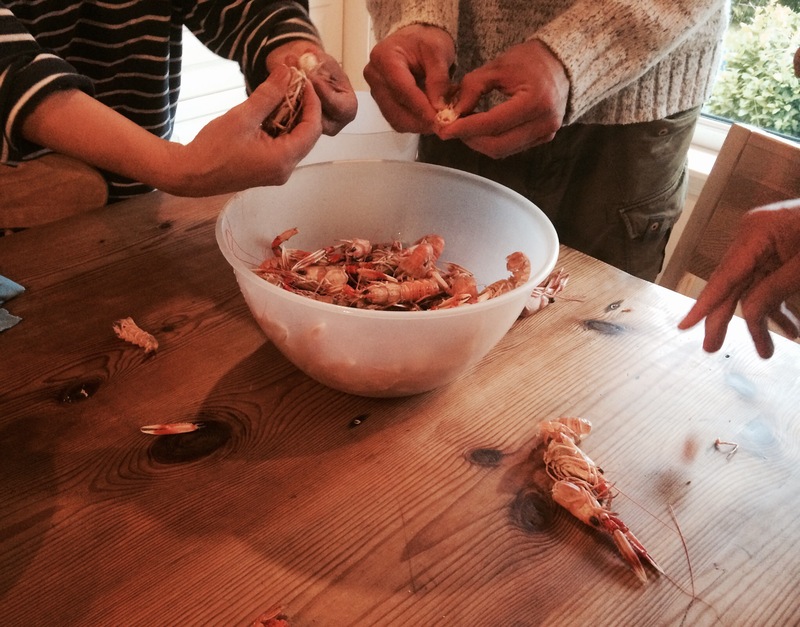 Langoustines (here donated by a very kind cousin) are excellent for communal eating and drinking. They even work as a garnish. While not technically a ‘seafood’ Samphire Grass is collected from the seashore and can usually be purchased in a fishmongers around June. 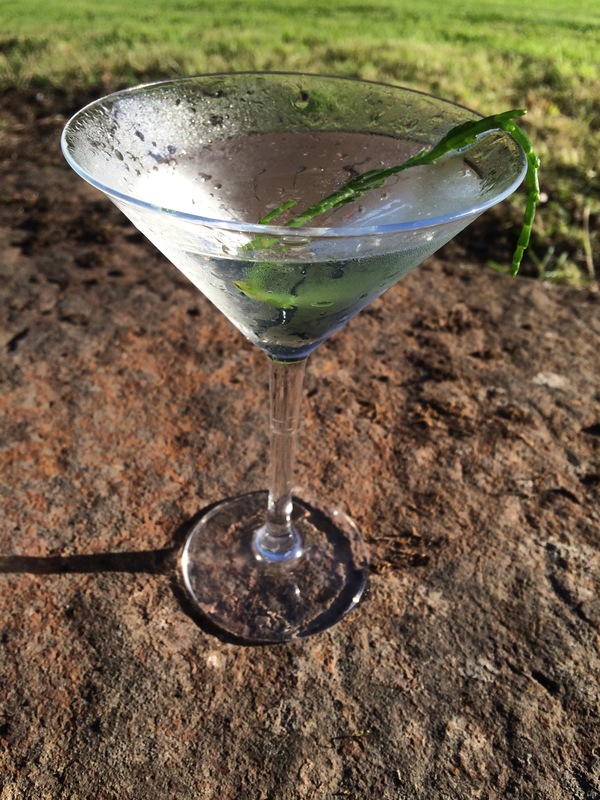 It makes a tasty, crunchy, briny and fresh accompaniment to a martini and even an unusual garnish. This is a Scandinavian-style platter I put together for some friends at mid-summer last year. It’s also good for communal eating and drinking. This one was dead easy. 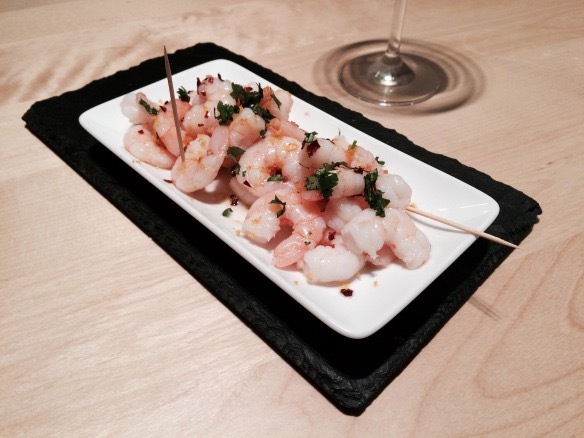 It’s prawns in a coriander and honey dressing, on this occasion served with a coriander martini. 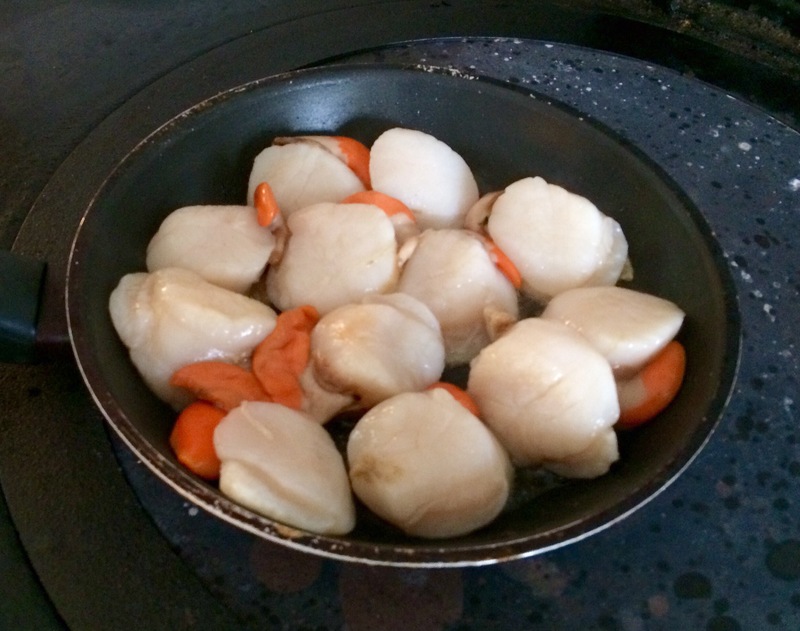 Here are some more scallops, this time pan fried in butter with pancetta. 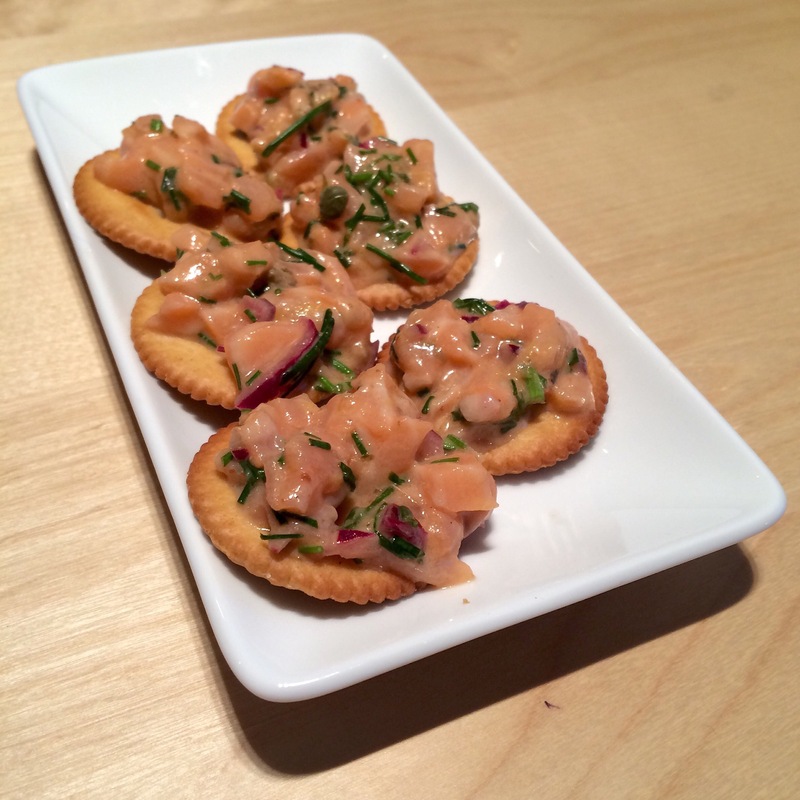 These are salmon tartare canapés. They’re a bit more fiddly but I love the sharp citrus tang of the oily smooth salmon on a crunchy cracker. It does seem to lend itself to a martini. There also seems to be a seductive element of risk involved in eating raw flesh which I think lends itself beautifully to the stark danger of drinking one or two martinis. And finally, the dead easy but exotic Latin American treat: a Ceviché and Leche de Tigre martini. This variation recipe is one of my favourites. I was lucky enough to be introduced to seafood at an extremely early age by my dad, who was a scallop diver working off the west coast of Scotland at the time. I will think of him every time I eat it for the rest of my life. 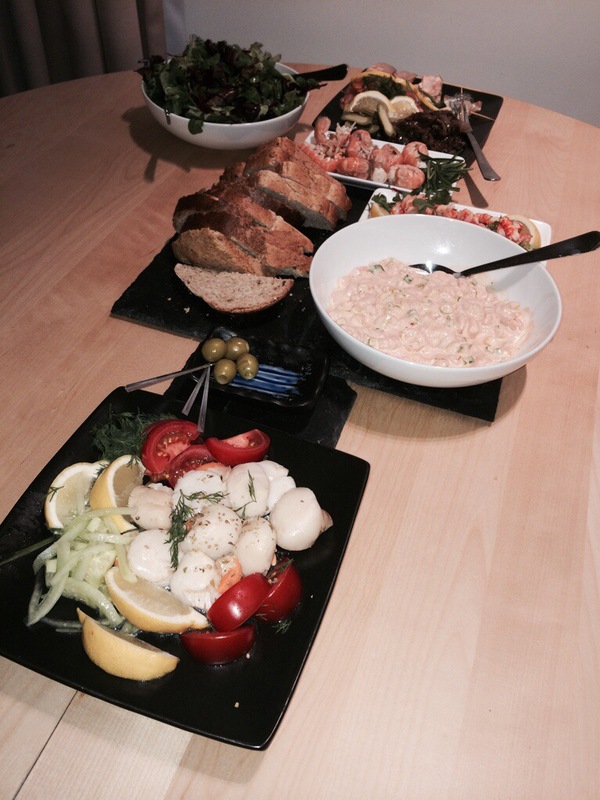 This entry was posted in Canapés, snacks and nibbles, The Diary and tagged fruit du mer, scallops, seafood by themartinidiary. Bookmark the permalink. Here’s to Dad’s influences over our lives. 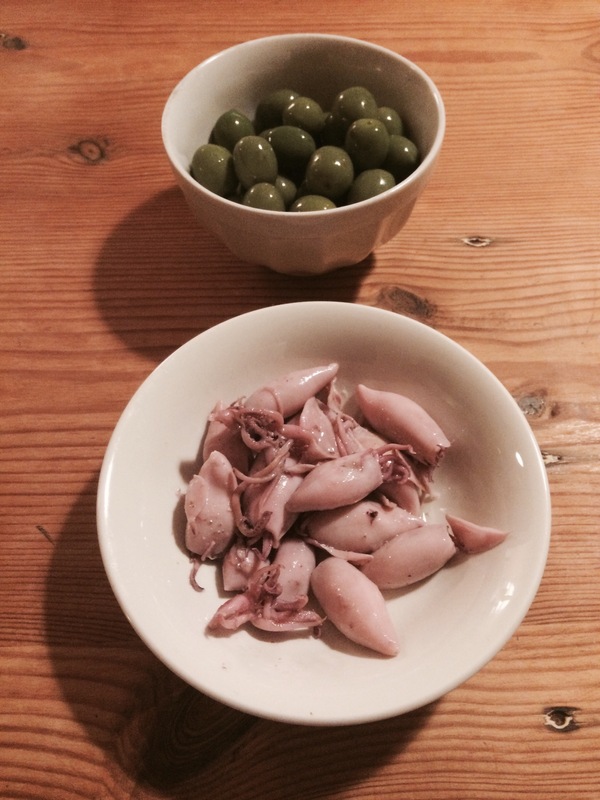 A veritable feast of seafood – I am offically hungry and have just got squid out of the freezer.